As we moved from fall to winter this year temperatures started dropping significantly, and so did our indoor humidity. We have gas heat with baseboard radiators, it’s not as drying as forced air heat can be, but using our Analog Hygrometer by Western Humidor we could see that the humidity levels were sinking rapidly. We think a comfortable range is about 40-55 percent humidity and the house was dropping well into the 30 percent range. Not only is this bad for the humans, but it is very uncomfortable for budgies. We began using our Travel Ultrasonic Humidifier – Mini Cool Mist Water Bottle Humidifier Offers Perfect Portable Solution for Home, Office, Hotel, and More , which puts out a surprisingly good amount of humidity, and we prefer it to purchasing a big traditional humidifier (like a Ultrasonic Cool Mist Humidifier – Premium Humidifying Unit with Whisper-quiet Operation, Automatic Shut-off, and Night Light Function ) for a couple of reasons. One because big humidifiers are harder to maintain and would need vigilance and lots of cleaning to keep mold out of the picture and two because of Patrick’s chemical sensitivities, bringing a big new plastic appliance into the house is a challenge. It would probably end up in the garage for months (at best) off-gassing whatever chemicals it came with. I also tried using our Crock-Pot SCCPVL610-S 6-Quart Programmable Cook and Carry Oval Slow Cooker, Digital Timer, Stainless Steel as a humidifier, which you should only attempt if you are going to be home AND your birds will be safe at home in their cage. This is simple enough to do, just fill the crock with water and set it for a few hours; with the lid off the water should simmer and release steam. We tried on the low setting and it didn’t do enough to be worth bothering. I intended to try it on the high setting but then we decided to invest in a few more travel humidifiers so it hasn’t been necessary. That reminds me, I know a lot of folks probably miss being able to use candles, febreeze, diffusers and the like after they get budgies, and one way to safely scent your home would be to put a cinnamon stick in your crock pot while you’re steaming your house. You can also fill the crock half way, add a few tablespoons of baking soda and turn the crock on low to deodorize a room naturally as well. So far the budgies seem to be doing okay with winter dryness, however, I could see quite easily that it was taking a toll on their feet. I neglected to take any pictures, but their feet were starting to look a little cracked and like the skin was peeling up a bit. Nothing drastic that would indicate a medical problem, just a bit like the skin on human hands if you don’t moisturize in winter. I immediately started googling and found a couple of possible solutions, one of them is to use a tiny bit of Carrington Farms Organic Extra Virgin Coconut Oil, 54 Ounce on their feet. There are a few ways I can think of to get the oil on their tootsies, one is to apply the oil to a finger used for step up, and then sneak attack your thumb onto their feet to apply more on top. Alternately you could put the oil on a perch and just let them land, or you could hold/towel them and just get the job done. In doing my research I was warned against getting ANY oil on their feathers as it can impede their ability to fly. 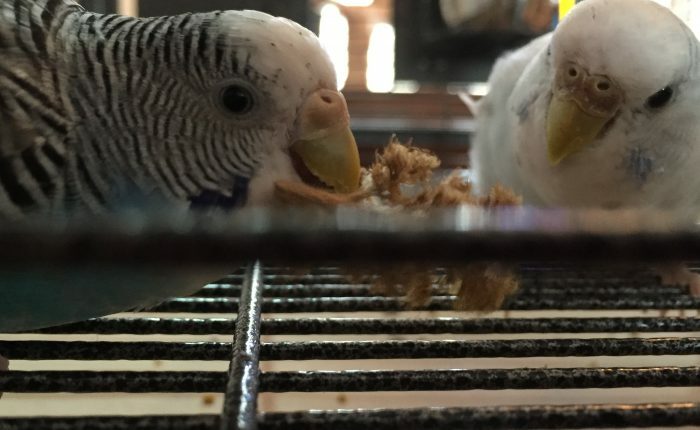 Also I was warned that the coconut oil could give them diarrhea if they ingested it, so I would recommend using sparingly, although I also uncovered evidence that some folks give their parrots coconut oil to eat as a supplement, so like most parrot-related issues there’s bound to be a hot debate over who’s doing what wrong! The person who warned against the potential for diarrhea suggested using baby lotion instead, but I feel a little uncomfortable about that, since they nom their feet pretty often for personal maintenance I would prefer they were nomming on something that is actually food. I ordered the coconut oil and also started giving them a shallow dish of water to splash around in inside of their cage (also only while I’m home). They really like running around in water and I usually throw in some spinach leaves or a few small broccoli florets to make it more interesting. Also that way I can pretend they are eating some vegetables! This splash pool is in addition to a weekly (at minimum) offer of a bath in the Lixit Corporation BLX0787 Quick Lock Bird Bath and/or hanging greens. Even though the coconut oil only took a few days to get to us thanks to Amazon Prime shipping, by the time it arrived their foot dryness had completely resolved thanks to walking around in water every day. So, that’s a huge testament to the power of water keeping budgie feet in good condition. Of course I’m glad to have the coconut oil on hand, and similar to several other occasions where I completely misjudge sizes I certainly have a lot of it – I guess Patrick and I will need to start cooking with coconut oil! 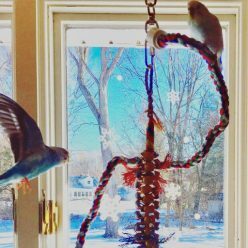 Previous Previous post: When will my parakeet talk?